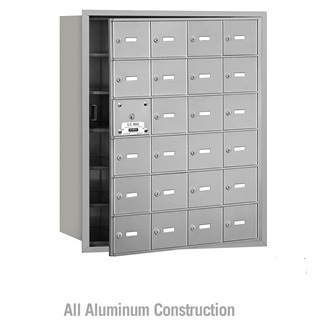 3600 series horizontal mailboxes are constructed from all aluminum extrusions and materials. Standard configurations are based off of "A" size doors which are 5 1/4""H x 6 1/2"W.
Units are quick to install and give a finished appearance when recessed into a wall opening. Mail receptacles are USPS 4B+ Compliant which certifies this mailbox as endorsed for replacement purposes only. 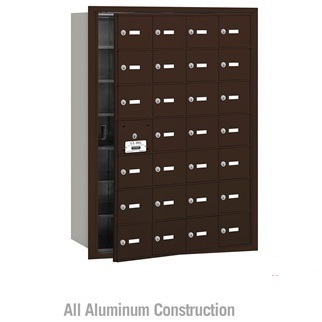 (NO CHARGE FOR DIFFERENT FINISH CHOICES) Finish choices for the 3600 series horizontal mailboxes are aluminum, bronze, gold, or sandstone powder coat. Color chips are available upon request. (STANDARD) Cardholders are a type of door identification for the 3600 series horizontal mailbox that includes a 2"W x 5/8"H clear plastic holder and card for each compartment door. The card can be marked by you in the field to identify each door how you want. (+$60.00) Custom engraved placards are self-adhesive and measure 2"W x 0.625"H x 0.25"D that can be custom engraved as you specify. (+$105.00) Custom engraved door identification for the 3600 series horizontal mailboxes can be customized according to your requirements. Custom engraved door characters will be silver in color because 3600 series horizontal mailboxes are fabricated from aluminum. (+$105.00) Custom black filled engraving is viewed by many as the most attractive door identification option. The mailbox door characters are engraved to your requirements and then each character is filled with black ink to accentuate the door identification. (STANDARD) USPS access means that the mail receptacle will be used for U.S. Mail delivery delivered by the Postal Service. 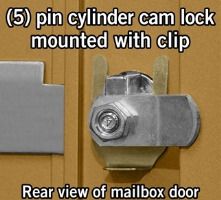 In this case, a master door or cover will be prepared for the postal master lock which the USPS will install in the field typically at no charge. (+$30.00) Private access signifies that the receptacle will be used for a private application. In this case, the master door will be equipped with a commercial lock. 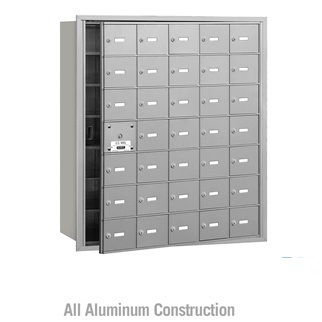 (STANDARD) Front loading horizontal mailboxes require a door to be reserved for master access by the delivery person. 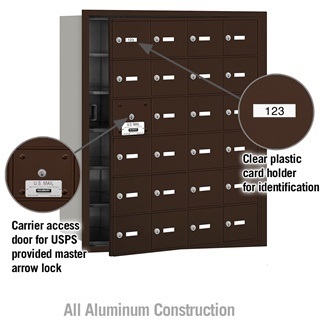 (NO ADDED CHARGE) Rear loading horizontal mailboxes do not require a master access door because master entry is gained through the rear of the unit. All door compartments are usable for rear loading mail receptacles. Units include a removable rear cover if this option is chosen. USA Building Supplies can put together a quote to meet your exact specifications and requirements.